KMI bring their trademark tactile genius to the world of percussion pads. Keith McMillen Instruments (KMI) may not be a name you’re familiar with, but Keith himself has been involved in the development of a number of innovative products over the past 35 years that you may well have heard of. These include the Zeta Music electric violin and the first programmable audio mixer and router, the Akai MPX820 and MB76. Keith’s ambition to design instruments that feel natural and respond “with all the nuance and sensitivity that makes an instrument musical” led to the birth of KMI, who now make a range of intriguing controllers based around a smart fabric technology used in the automotive, sports and safety industries, and developed by sister company BeBop. The latest offering from this partnership is the BopPad. 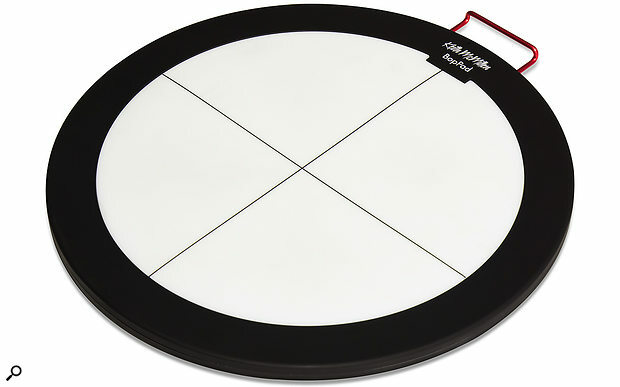 The BopPad looks like a regular drum practice pad, 10 inches in diameter and comprising a circular playing surface with a hard surround, but there’s more to it than that. By using a single sheet of eighth-generation ‘smart fabric’ covered by a tuned elastomer surface, KMI have created an incredibly expressive and dynamic drum pad controller that is extremely sensitive not only to velocity but also to pressure and positional information. Its design is deceptively simple, the sole connection being a micro USB socket at the top of the unit, neatly protected from stray hits by a red metal guard. 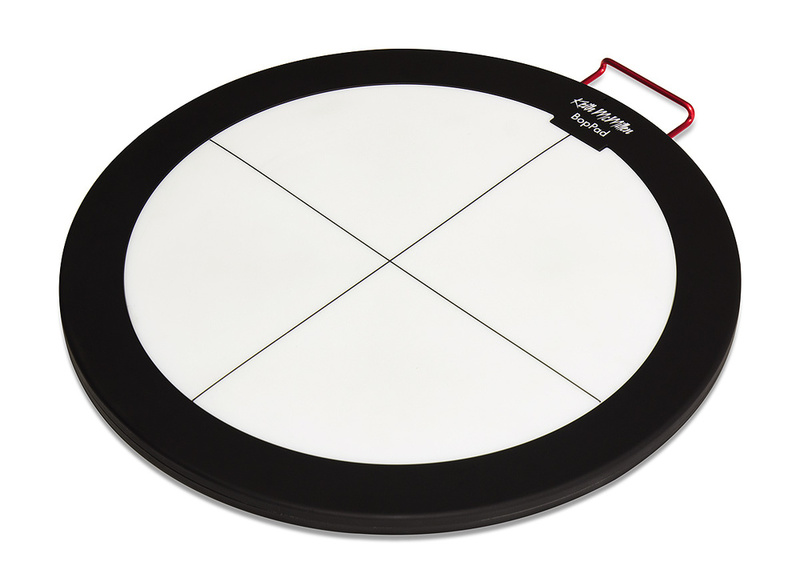 The only visual features that suggest the BopPad has more to offer are the black lines that divide the playing surface into four equal quadrants. Playable with sticks, hands or fingers, the four independently programmable quadrants can output MIDI notes, velocity, pitch-bend, pressure and location continuous controllers, making the BopPad not only a very expressive controller but also a very powerful way to trigger virtual instruments, synths and drum modules. The BopPad is class-compliant, which means you can connect it to just about anything that speaks MIDI. After connecting it to your computer, the only sign of life is a small LED below the USB socket, which glows green when the BopPad is powered and changes to orange to indicate USB activity. This is, I guess, in keeping with the minimalist approach, and with no physical displays, knobs or buttons, all the programming of the BopPad is done using editing software that is available for Mac OS, Windows or within an online Web browser. The editor is logically laid out on a single screen, and can be scaled to fit any size of monitor. At the top right is a visual representation of the BopPad itself. As you click on each of the four quadrants, the colour of the screen changes, showing a different colour for each quadrant — a useful reminder of which quadrant you’re currently editing. The BopPad editor software. 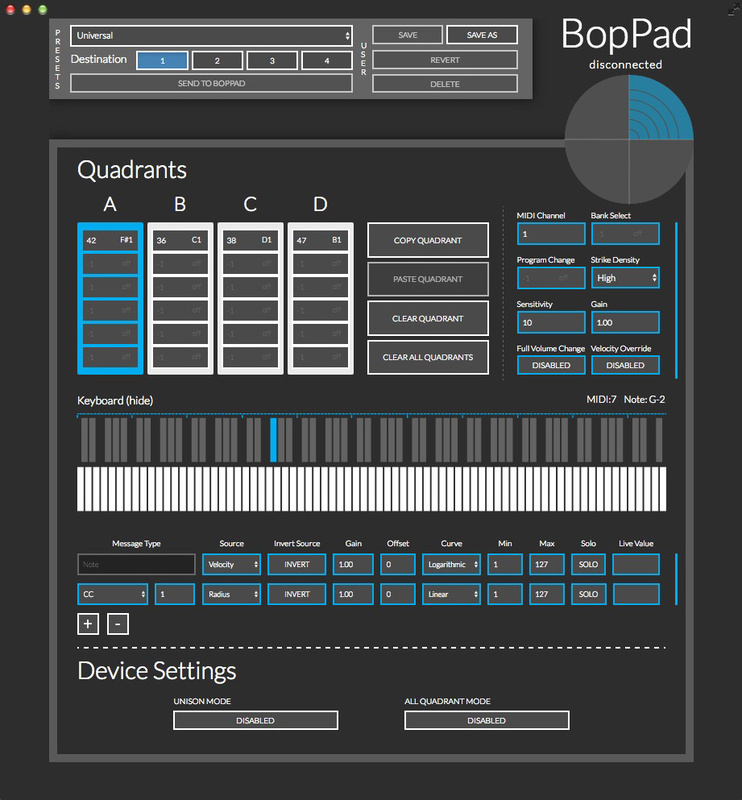 In its simplest form, the BopPad could be configured to send four different MIDI notes, one from each quadrant, to trigger perhaps the kick, snare, hi-hat and cymbal from a virtual instrument or module, which you could then play with sticks, hands, fingers or anything you like. However, each quadrant is capable of sending up to six simultaneous MIDI notes, enabling you to play chords on a synth or layer up multiple percussion samples. An on-screen MIDI keyboard can be used to select the notes, or you can type in the values manually. Global parameters that apply to each quadrant include MIDI channel, Strike Density, Sensitivity and Gain, plus program and bank change messages. To speed up data entry, four buttons are provided on screen to copy, paste and clear data from one or all quadrants. A neat feature is Unison Mode, in which the BopPad functions as a single pad, with all four quadrants using the same settings. I used this mode to turn the BopPad into a conventional electronic drum pad triggering a sampled snare drum. Playing some fairly complex patterns using sticks, the dynamics were interpreted perfectly, from the lightest touch to quite heavy strikes, and the latency is imperceptible (at a stated 3ms). I’ve reviewed a fair few percussion pads and controllers for SOS, and what I find most exciting about such devices is their ability to manipulate sounds in real time, as you might with real percussion instruments, using different playing techniques. The smart fabric technology is what makes this level of control possible in the BopPad by providing three modulation sources. Velocity, pressure and ‘radius’ respectively measure how hard you hit the pad, how much pressure you apply, and where on the pad you play. In addition to the notes being sent by the quadrants, controller messages can also be assigned to each of these sources: continuous controller, poly aftertouch, channel pressure and pitch-bend. Up to five different controller messages can be sent simultaneously from each quadrant. These continuous MIDI messages, along with their parameters, are laid out in horizontal rows across the lower section of the editing software, and are referred to by KMI as Modlines, which I assume is short for ‘modulation lines’. What you can do with this data is, to a large extent, dependent on your sound source and how it responds to the various incoming controller messages. It’s fair to say the vast majority of virtual instruments and ‘real’ synths and samplers allow for a very wide range of control of their parameters, so in most cases you’ll not be stuck for something to modulate! Each Modline also offers a number of user-definable parameters: Invert Source, Gain, Offset, Curve, Minimum/Maximum Values and Solo. Invert, Gain and Offset do what you might expect by inverting the MIDI data through 180 degrees, adding virtual gain or offsetting the transmitted MIDI values by a predetermined amount. The Curve parameter lets you select one of seven preset or four user-defined response curves: Linear, Logarithmic, Exponential, Light, Medium, Hard and Dynamic. Each type of curve affects the way the BopPad responds to your touch. Working with multiple modulation sources simultaneously can become quite confusing, and the Solo button lets you isolate each Modline as you edit, so that you only hear how that specific parameter is affecting your sound source. Finally, a useful Line Value box is present at the end of each Modline showing, in real time, the value of the MIDI data being sent by that specific controller. Using MOTU’s MachFive 3 sampler as my sound source, I was able to create some interesting patches. MachFive synth parameters and effects can be governed using continuous controller messages, so it’s very simple to use pressure sensitivity to send pitch-bend information, for example, or attach a continuous controller to reverb depth and make it increase as you move your hand from the centre to the edge of the BopPad. I have reviewed (and own) both the Korg Wavedrum and Roland HPD20 Handsonic. With a little careful editing and sound selection, I was able to create patches with the BopPad that came very close to emulating both of these more expensive instruments. Using pressure sensitivity to ‘bend’ a talking drum sound as you play, it or opening a filter and brightening a conga sound as you hit closer to the edge of the BopPad, for example, makes playing percussion samples a far more expressive and realistic experience. More esoteric Wavedrum-style patches were easily achieved by combining ethereal pads and percussive voices with reverb and delay effects that changed as I moved around the BopPad surface or increased playing pressure. The BopPad hardware itself can store four presets, recalled using program change messages, but the editor can store an unlimited number, saved and loaded using the standard File menu. I really enjoyed using the BopPad. Unlike devices such as the Wavedrum and Handsonic, it’s entirely dependent on external sound sources, but with careful programming it’s possible to create stunning patches that respond incredibly sensitively to both dynamics and positional touches. The hardware is light and extremely durable (watch the YouTube video where it’s run over by a truck! ), which makes it ideal for travelling or using live. From a physical perspective, the BopPad couldn’t be simpler, but from a playing and performance point of view it’s extremely powerful. I use a number of percussion controllers and the BopPad offers playability, sensitivity and functionality to compare with any of them. The elastomer surface that covers the smart fabric feels very much like a practice pad when played with sticks, but works equally well with the more delicate touch of hands or fingers. Pressure and radius messages are transmitted smoothly and evenly as you press the pad or move your fingers around each quadrant, and allow for very expressive playing techniques. For percussionists and non-percussionists alike, playing a sound source using something like the BopPad rather than a conventional keyboard can be a very creative process, inviting expression and techniques you perhaps wouldn’t normally use. At only £179$199, this is a great addition to any percussionist’s or programmer’s arsenal. The BopPad works perfectly placed on a desktop or any flat surface, but KMI also produce a lightweight, anodised aluminum mount (£29$29) that connects to a cymbal stand, providing a convenient way to incorporate a BopPad into your drum kit. 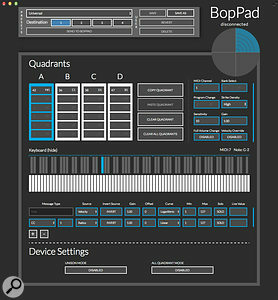 Interfacing the BopPad with stand-alone MIDI instruments can be achieved using the KMI MIDI Expander (£59$59). Connect the BopPad via its mini USB connection and you can transmit and receive MIDI information via standard five-pin DIN MIDI In and Out ports. Only programmable using an editor. Beneath its minimalist exterior lies a very flexible and powerful drum pad controller that allows for a wide range of expressive and creative control over any MIDI-based sound source or virtual instrument. BopPad £179, BopPad Mount £29. Prices include VAT. MSL Professional (0)207 118 0133. BopPad $199, BopPad Mount $29.